Since we are always already listening, it is difficult to achieve a sense of perspective on how we approach the act itself. If one’s perception of sound is altered or modulated through a listening device, then upon returning to the ‘norm’ of one’s naked year, one may be able to gain some understanding of the act of listening. A listening device defamiliarises the ear and brings sound to the experiential fore and thus shifts the focus away from a default visual priority and the habits of the naked ear. The Listening Devices designed by architect Lara Karady and sound artist / composer Alex De Little modulate sound according to specific aspects of our auditory sense, such as the ability to sense direction, the ability to perceive frequency, the ability to hear the distance of an object, or the ability to hear at all. Devices resonate, channel sound, block sound, and amplify sound in certain ways. They are activated by users’ movement and interaction, and each device provides an opportunity for a particular approach to listening. 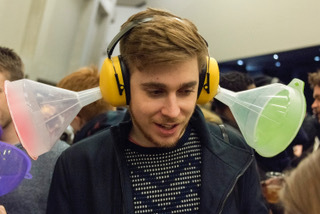 This edition of Points of Listening explores the Listening Devices in the context of a series of games, which use the devices to explore our engagement with listening through movement and singing. In these games everybody is a listener, but each listener is also participant, performer and audience member. In this context, a series of individuals morph into an interdependent group whose characteristics are constantly morphing and contingent on the interrelationships between each and every listener. Alex De Little is a researcher and sound artist, whose work has been featured at the London Contemporary Music Festival, the Tate Modern, East Street Arts’ Patrick Studios, The National Media Museum, the Stanley and Audrey Burton Gallery and the Hepworth Wakefield. He is completing a practice-based PhD with Scott McLaughlin and Martin Iddon at the University of Leeds. Alex’s practice is concerned with how we listen and perceive our spatial environment through sound. He is interested in sound as a medium through which we can understand the world and creates interventions that allow people to think and play through sound.